Swiss voters approved a ban on construction of new minarets on Sunday, a surprise result certain to embarrass Switzerland's neutral government. The Swiss news agency ATS and other media said about 57.5% of voters and all but four of the 26 cantons approved the proposal in the nationwide referendum, which was backed by the right-wing Swiss People's Party (SVP). The government and parliament had rejected the initiative as violating the Swiss constitution, freedom of religion and the country's cherished tradition of tolerance. The government had said a ban could "serve the interests of extremist circles". The United Nations human rights watchdog also voiced concern. The government said it would respect the people's decision and declared construction of new minarets would no longer be permitted. "Muslims in Switzerland are able to practice their religion alone or in community with others and live according to their beliefs just as before," it said in a statement. Justice Minister Eveline Widmer-Schlumpf said the outcome of the vote reflected a fear of Islamic fundamentalism, but the ban was "not a feasible means of countering extremist tendencies". A group of politicians from the SVP, the country's biggest party, and the Federal Democratic Union gathered enough signatures to force the referendum on the initiative which opposes the "Islamization of Switzerland". 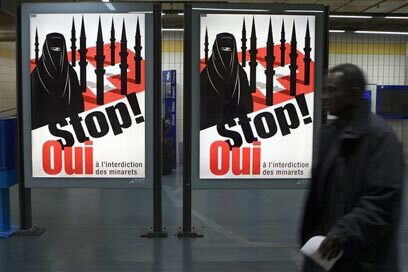 Its campaign poster showed the Swiss flag covered in missile-like minarets and the portrait of a woman covered with a black chador and veil associated with strict Islam. "We're enormously happy. It is a victory for this people, this Switzerland, this freedom and those who want a democratic society," Walter Wobmann, president of the initiative committee, said in a victory speech in the town of Egerkingen near Berne. Earlier, Wobmann told Reuters: "We just want to stop further Islamization in Switzerland, I mean political Islam. People may practice their religion, that is no problem." "We want to stop the further developments -- minarets ... Sharia law," the SVP parliamentarian said. "The minaret is the power symbol of political Islam and Sharia law." The Alpine country of nearly 7 million people is home to more than 300,000 Muslims, mainly from Bosnia, Kosovo and Turkey. Four mosques among the country's estimated 130 to 160 Muslim cultural and prayer centers, have minarets, including those in Geneva and Zurich. The call to prayer is banned in the country. The result is likely to strengthen the hand of the SVP, which has been accused of racism for its anti-immigration campaigns, including a poster showing white sheep kicking a black sheep off a Swiss flag. "Today the SVP has to take responsibility for this provocation and assume the consequences. We are the only Western country to inscribe into our constitution a ban on the construction of minarets," Ada Marra, a Social Democrat parliamentarian from Vaud canton, said on Swiss television. "No, there is no link between the two. It's not a restriction on Islam. We can't trade a democratic decision for money. That would be absurd - prostitution!" In Geneva, home to UN humanitarian agencies, voters appeared to have rejected the initiative by nearly 60%. A Geneva voter, Antonio Spagnolo, told Reuters television as he left the polling station: "I'm shocked ... I'm against this initiative because I think it's intolerance." See all talkbacks "Swiss voters back ban on minarets in referendum "